Amazon currently has Seventh Generation products 15% off for Amazon Mom members only. Use coupon code SEVCLEAN at checkout. Don’t forget to use the Subscribe & Save option to save another 15% off these products. Check out the wipes deal I mentioned earlier today, or look here for more products. Thanks The Thrifty Mama! All You (one of my favorite magazines!) 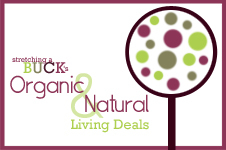 has a great article here about finding affordable organic foods. When you purchase 2 Annie’s products you can enter your UPC’s here and receive a Gardening Gift Pack from their Root 4 Kids Program which includes veggie seeds, gloves, and gardening guide. Thanks Organic Deals! Mambo Sprouts has some great printable coupons including $1/1 Organic Valley Soy Milk and $1/2 Stonyfield Oikos Yogurt.